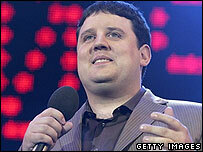 Award-winning comedian Peter Kay is to star as a villain in the new series of Doctor Who on BBC One. Kay - whose TV credits include Phoenix Nights and a stint in Coronation Street - will play powerful Victor Kennedy. The role came about after the 32-year-old comic wrote a fan letter to Doctor Who writer Russell T Davies. The series - to be screened on BBC One in the spring - sees David Tennant take over the role of Doctor Who from Christopher Eccleston. Davies said Kay will be taking on a serious role. "We are delighted to welcome Peter onboard the Tardis," he said. "Casting of Peter came about after he wrote me the most brilliant letter to say how much he'd enjoyed series one of Doctor Who. "From that point on we started talking about a guest appearance." Kay, who has had straight roles in Paul Abbott's Butterfly Collectors and The Secret Life of Michael Fry, will appear in episode 10 of the new series, which also stars Billie Piper. He joins an array of actors who have already signed up to the series including Only Fools And Horses' Roger Lloyd-Pack, Pauline Collins, Anthony Head, Maureen Lipman, and former EastEnders actress Tracy-Ann Oberman.